Welcome to my newest series, Controversy in Fiction! 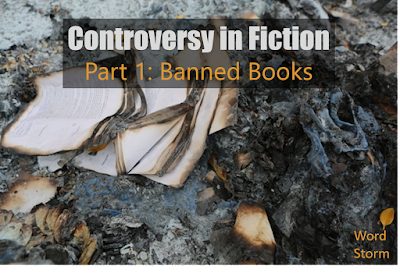 This month, I’ll be addressing banned books, part one in my five-part series. Disclaimer: Because of the nature of this series, I don’t expect all of my readers to agree with me. While I will attempt to accurately present both sides of particular issues, I will take sides on some issues and can’t expect to cover every last issue in existence. I apologize in advance for anybody who is offended for religious/political/book-loving reasons; it is not my intent. Please no hateful comments as this is a children-friendly blog. Caution: This post contains spoilers for The Outsiders for the purpose of discussing why it’s sometimes banned. Back in my undergraduate days at Evangel, I took a course on Young Adult fiction. It was completely awesome. We got to read some of my favorite genres for homework, and I discovered some of my treasured books too! One of our first weeks of the class, we talked about banned books. Banned books are those restricted by libraries, schools, religious institutions, etc. for the purpose of preventing children or others from reading content considered inappropriate. Books may be banned for various specific reasons including, but not limited to profanity, violence, sexually explicit content, or religious or political agendas. For our assigned reading, our class read The Outsiders. When I first picked up the book (I borrowed a copy from my professor), I thought, “Huh, this looks okay.” I wasn’t so sure about it. But before I knew it, I’d finished the book and thoroughly enjoyed it! When my sister (12 at the time) had to read the book for her class, she completely fell in love with the story and the characters. My mom skeptically picked up the book, but in the end, she liked the story. Is this the kind of book parents would want their children to read? Probably not. But it does have its redeeming values (self-sacrifice, compassion, etc. ), and it is for these qualities that many readers will advocate for reading the book and encouraging others to do so. But at the same time, I wasn’t allowed to read the Harry Potter books until I was 16. I have since finished the series, much to my mom’s chagrin. And while I don’t believe the books are inherently bad, (I quite enjoyed them actually) I respect my parents’ decisions. I was raised in a conservative, Christian family, and my parents wanted to protect me from sorcery, even in fiction. Yet while many book banning’s I’ve experienced may have good intentions, there are still associations who would rather ban books to exercise control. In Fahrenheit 451, all books were outlawed country-wide for encouraging people to think. In The Book Thief, Nazis burned books for their radical agendas. And in Ink and Bone, certain knowledge was forbidden for the sake of the Great Library’s control. But as far as I’ve seen, most of the book banning that occurs today has good intentions, particularly the protection of children’s innocence, rather than governmental control. But eventually all children will grow up. While it may be important to maintain a degree of discretion when choosing books, they can be eye-opening. After all, books can teach you new things. Books can help you become a better person. Books can warn you about the dangers of certain people and relationships. Books can make you think. Books can help you be more empathetic. I could go on and on about the power of fiction. Ultimately, I believe books should be picked up based on personal preference. Yes, knowledge can be dangerous. But the real danger for people, especially readers, comes when others exercise governmental control over reading. But even in the US, where so many people know how to read, they don’t. Reading is often viewed as a chore or work rather than a preferred pastime. Literary references: S. E. Hinton’s The Outsiders, Frank E. Peretti’s This Present Darkness, J. K. Rowling’s Harry Potter series, Ray Bradbury’s Fahrenheit 451, Markus Zusak’s The Books Thief, and Rachel Caine’s Ink and Bone. What’s your opinion on book banning? What are some of the banned books that you’ve read? Have you ever snuck a forbidden book to read it?